Filmmakers are part of a highly collaborative community. We turn to each other for solutions, assistance, and even ideas. I have gained so much from the filmmaking community, so I wanted to be able to give back. That is why I have created this page of free tools and assets that I have either created myself, or have found helpful over the years. I hope you find them helpful as well. Enjoy! The Elgato StreamDeck is a fantastic tool for live streaming videos, but can also be extremely useful for accessing applications, social media, and even video editing. The StreamDeck allows you to program custom functions, hotkeys, and actions to the touch of a single button. But the real awesomeness of this device is the ability to customize your own icons for each of the buttons! I have spent a while creating icons for my StreamDeck, and decided some of them may be useful for some of you out there as well! I hope you enjoy this icon collection! NOTE: This collection is icons only. You will still need to program the commands using the StreamDeck software. With Micro Four Thirds sensor sized cameras like the Panasonic GH5 becoming more and more popular these days, a lot of filmmakers are adapting their current lenses for use on these camera bodies. Many of these cameras, the GH5 included, now have the technology built in to stabilize the camera sensor. This means that manual lenses without any stabilization can actually be stabilized by the sensor. However, when using a true manual lens, you will need to tell the camera what focal length lens is attached so that it can stabilize the sensor accordingly. 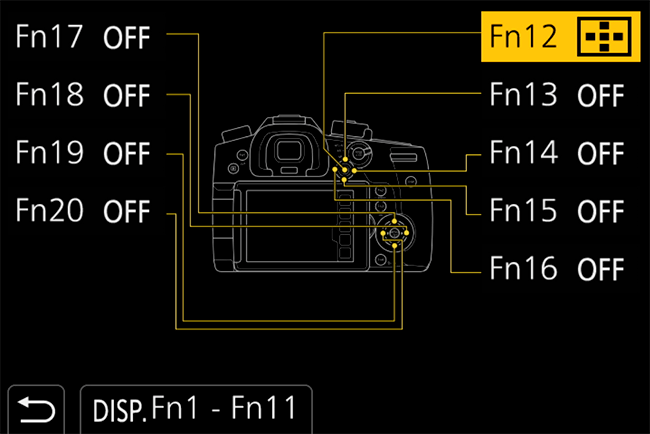 This can cause some confusion when taking crop factor, and potentially Speedboosters, into account. I have created a massive "cheat sheet" for various focal lengths that will let you know exactly what you should be inputting into the camera so that the IBIS works properly. I also included the "effective focal length" of each lens when taking into account the Micro Four Thirds crop factor. Taking it one step farther, I also included calculations for use with Metabones Speedboosters, both at .71x and .64x focal reduction. Hopefully this sheet will help you to understand how your lenses will behave on a Micro Four Thirds camera like the GH5, and will allow you to properly stabilize your full manual lenses. Upon receiving my GH5 I decided to dig into its customization settings and tweak its functionality to better suit my style of filmmaking. This camera profile includes global changes, C1 through C3-3 custom profiles for various shooting modes, reassignment of function buttons, customization of the Quick Menu, and population of My Menu. I have tailored each of these categories to enable me to work quickly and efficiently while shooting video with the GH5. Please feel free to use this as a base setting and tweak any functions you would like to be different. Please note that I have disabled most of the Auto Focus settings and options in this camera profile. I prefer to work with manual focus and do not use Auto Focus often. This profile works best when the camera is switched to Manual Focus mode. If you prefer to rely more on Auto Focus, you can make the necessary changes to the camera profile in camera and save them. I currently have V-Log L installed on my camera, so this setup uses V-Log L as the default photo profile for all the settings. If you do not have V-Log L installed on your camera these settings will install, BUT WILL NOT GIVE YOU VLOG. I plan to release a separate camera profile using the Natural photo profile as the default. Natural is my preferred photo profile when not using V-Log L.
In a lot of my videos I like to apply a “letterbox template” to give my 16:9 footage that cinematic look. 16:9 refers to the aspect ratio of the frame. Old SD footage was displayed in 4:3 format, and the commonly used “widescreen” format for videos and television is now 16:9. However, traditional films shown in theaters have always had a slightly wider aspect ratio. This is because the cinema industry began shooting on anamorphic lenses that gave the footage a much shorter and wider look. To this day, we associate this shorter and wider aspect ratio with video and film that feels more cinematic. Because the true anamorphic lenses that will give us this look are extremely expensive, filmmakers will often simply mask their footage in post to achieve this cinematic aspect ratio. The most common of the ratios is 2.35:1, but there are many options, depending on the look you are hoping to achieve. This pack of letterbox templates is one I found from www.ehartfordstudos.com and have been using on all of my 2.35:1 videos. This pack contains all of the aspect ratios and all of the video resolutions you could ever need. All you need to do is place the .png mask over the length of your video to add the appropriate sized black bars to crop your footage. NOTE: Your video will still export according to the aspect ratio of your sequence. This will not crop your video on export, but will simply add the appropriate black bars at the top and bottom of the frame. If you are looking to do more than simply export your video as 16:9 with black bars cropping it to 2.35, you can actually export your video in a 2.35 format. Currently YouTube does not accept this format and will add black bars back in, but when uploaded to Vimeo this export setting will display your video in a 2.35:1 aspect ratio without bars. Included in this pack are Adobe Media Encoder presets for both YouTube and Vimeo. It includes Vimeo in 1080p, and YouTube in 1080p and UHD 4K (2160p). If you are looking for some ready-to-go presets for 4K exports from Adobe Premiere Media Encoder CC, all you need to do is download and import this preset pack. This pack includes presets for exporting both in UHD 4K at 3840x2160 or in Cine 4k at 4096x2160. It also includes export presets for standard 4:2:2 and 4:2:2 LT. NOTE: These are presets only. You will need to have the ProRes codecs already installed on your system. One of the best ways to increase the dynamic range of your camera and retain the ability to color grade your images in post is by shooting in a flat Log profile. More and more cameras these days are including these flat profiles as recording options. Canon has Cinestyle and C-Log, Sony has S-Log2 and S-Log3, Panasonic has Cinelike-D, GoPro has ProTune, and Blackmagic has BMDFilm. Each manufacturer records these profiles slightly different, so each will need a different treatment in post production to acquire the look you want. One of the fastest ways to grade your Log footage is by using a LUT, or Look Up Table. This is a profile that can be loaded into your color grading program that tells the software how to interpret the footage it is receiving. While LUTs can be used to stylize your footage and create infinite possibilities for looks, some of the LUTs I use most often are a transfer to REC.709 color. REC.709 is the current broadcast standard color range. When you apply a REC.709 LUT to your Log footage it will instantly bring the color and contrast of your image to the REC.709 standards. This may not always be the final look you are going for, but it can be a great starting point to see what your footage can become. Ground Control Color is a great website I have found that provides a bunch of great LUT packs for different looks on different cameras. While most of the packs are available for purchase, they do have a number of free REC.709 LUTs you can download. I recommend you go and download these LUTs and start testing the Log profiles on your camera. DSLRs are fantastic cameras for shooting video. They offer a small and compact form factor and many of them have large sensors that can easily create a shallow depth of field. However, DSLRSs are photography cameras that have simply added the ability to capture video. This means their video codecs cannot always compete with professional, or even prosumer, level video cameras. DSLRs usually capture video and compress it using the H.264 codec. This codec is great at squeezing visual information into a relatively small container, but this is not always the best for editing and changing the look of your video in post. While many DSLRs do provide several different Picture Profiles that will change the way the camera interprets and encodes the visual information, they all tend to add an unwanted level of sharpening and saturation in camera. If you are looking to do some serious tweaking to your image in post production, you want to capture images as flat as possible to take advantage of your sensor’s full dynamic range, and take as much control over the image away from the camera as you can. Technicolor has created a Picture Profile called Cinestyle that does just that. It reduces the in-camera sharpening and saturation, and allows your camera to capture a higher dynamic range than the built in presets. While your video is still being compressed to H.264, you will have more detail and information in your image to work with in color correction and grading. You can download and install this profile from the Technicolor website for any Canon EOS DSLR.